This recording of Götterdämmerung is another astonishingly well-captured document of Krauss in Bayreuth that was just waiting to be released from the sonic straight-jacket of previous presentations. Computer analysis of the tonal response of the entire 4hr 20min recording, a crucial first step in an XR remastering, revealed a basic shortcoming in both the bass and lower midrange and at the very top of the audible range. 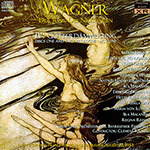 Using the immortal Solti Decca recording of Götterdämmerung as a guide - as well as referencing the previous three Krauss Ring operas released by Pristine - I was able to re-equalise the recording to bring out these previously somewhat submerged frequencies, allowing the performance to be heard in its full glory for perhaps the first time. As is quite usual in this kind of work, the remastering also shone a light on one or two shortcomings of the original tapes, where mild cyclical semi-dropout affected the beginning of the opera for a few minutes, and was detected later in the recording as well, again for a relatively short time. There was one other spot where the tape sounded less than totally smooth, but for the vast majority of the recording there were no such worries. Having dealt with rumble and tape hiss and applied Ambient Stereo processing I was able to sit back and enjoy the experience with minimal further intervention bar the excising of the odd cough and sneeze from the audience. A truly memorable recording to end one of the great Ring cycles, one that can at last be heard in its full glory. As I've commented before, this Ring can of course be obtained at budget price elsewhere, but without the advances that this remastering has brought to the cycle it can only ever be a somewhat thin and murky second-best listening experience by comparison. P.S. During the summer festival of 1953 in Bayreuth, Krauss also conducted Wagner's Parsifal. During the weeks that I've been working on the Ring I've had e-mails requesting that, upon its conclusion, I consider tackling this recording as well. I'm pleased to report that at the time of writing work is well underway on Parsifal, and we (just a little tentatively) expect to have this ready for issue quite shortly. I find the 1953 Bayreuth Ring conducted by Clemens Krauss and the 1955 Keilberth version to be the most consistently satisfying of all complete live-recorded Rings. The Krauss has been issued quite a few times in decent mono sound but Pristine Audio’s restoration of Siegfried and Götterdammerung (along with the first two operas) brings new clarity and vividness to the sound of these performances. The quality of the orchestral sound is where one hears the most notable improvement; it’s less congested, and many previously obscured details emerge. Comparing the Pristine Siegfried to a copy on Gala, one hears the difference right away. On Gala, the eerie prelude that opens the first act is interrupted by a loud cough (at :02) and a squeak (at :04) followed by a murky, indistinct sound to the low-lying instrumental lines. In the Pristine remastering, there’s less surface hiss, the cough and squeak are gone, and one can appreciate the nuanced playing of the opening contrabass tuba solo, a sinister sound that evokes Fafner, the dragon. Siegfried’s first two acts come across particularly well thanks to Krauss’s pacing and exceptionally fine playing by the orchestra. He achieves the sense of detailed storytelling in his lively, responsive pacing of Wagner’s large structures. The orchestra is always well synchronized with the singers. Climaxes are suitably exciting. As Siegfried, Windgassen has good musical instincts and enough rich tone and stamina to succeed in this tiring role. At times, there is something a bit thin and vulnerable about his singing that fits well with the character of the young Siegfried, a fool like the young Parsifal, another role in which the young Windgassen excelled. The most rewarding performances in this Siegfried come from the great singing actors Paul Kuen and Gustav Neidlinger, fully immersed in their roles, along with Hans Hotter, a truly great Wotan, captured here in vocally fine condition. As with Siegfried, Pristine’s remastering of Götterdämmerung succeeds at brightening and clarifying orchestral textures. As a musical performance, it’s at its most exciting when Uhde, Greindl, and Windgassen are onstage. Two of the three Norns (Von Ilosvay and Ira Malaniuk) sing outstandingly in the opening scene. The weak link in the cast is the unsteady Natalie Hinsch-Gröndahl as Gutrüne. Though I have reservations about the inconsistencies of Varnay’s singing, there is much to admire in her Brünnhilde. She is entirely involved with Wagner’s text, is capable of a rich outpouring of sometimes very beautiful tone, and has the stamina required for the role. The Immolation Scene finds her in very good shape. On the other hand, it takes her about 10 minutes to warm up in the Prologue’s opening duet with Siegfried. The glory of the Solti recording of Götterdämmerung is the playing and recorded sound of the Vienna Philharmonic, especially the brass. Birgit Nilsson’s Brünnhilde has admirable control of pitch and vibrato but lacks some of Varnay’s intensity, and Windgassen, past his prime in the 1960s, husbands his resources. Over the years, the artificiality of the Solti, a studio recording, seems like more of a liability. Both the Krauss and Keilberth Rings have the excitement of being live, continuous performances by an unsurpassed ensemble cast. Krauss may occasionally conduct with more taut control than Keilberth, but the Keilberth version, with much the same cast as the Krauss, is newly available in fine stereo sound. Ring enthusiasts will want to experience all three versions. This article originally appeared in Issue 34:2 (Nov/Dec 2010) of Fanfare Magazine.